In September 2017, the State Department pulled 21 diplomats and their families out of Cuba and stopped issuing travel visas to the country after embassy workers reported hearing loss, dizziness, speech issues, cognitive problems and other medical symptoms that appeared to stem from a ‘sonic attack’ in their homes or hotel rooms. Some Canadian embassy workers also reported feeling ill from a high-pitched noise. 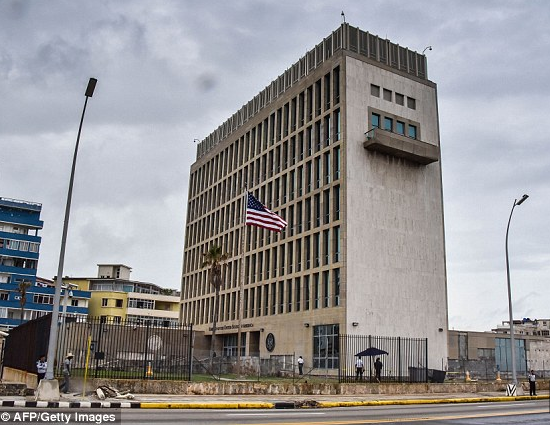 Doctors, FBI investigators and US intelligence agencies all tried to identify the source of the ‘sonic attack,’ with some people postulating that a sonic weapon or even a poisoning was being deployed against the embassy workers. The effected workers — who had reported hearing agonizing, high-pitched noises in very specific areas of their rooms — were found to have had suffered mild traumatic brain injury, but doctors at the time were not able to determine what exactly had happened to the workers’ brains. A new report from the University of Michigan now suggests the ‘sonic attack’ was actually the result of eavesdropping devices that were in too close proximity, which then accidentally set off an ultrasonic noise, the Daily Beast reports. If true, that would imply that the ‘sonic attack’ was actually an accident, not something aimed at deliberately harming American or Canadian embassy workers. ‘We’ve demonstrated a scenario in which the harm might have been unintentional, a byproduct of a poorly engineered ultrasonic transmitter that was meant to be covert,’ Kevin Fu, a University of Michigan associate professor of computer science and engineering, told the Michigan Engineer News Center. Fu, who researches computer security and privacy, and the co-authors of the study were inspired to look into what might have caused the ‘sonic attack’ after the AP released an audio sample that an embassy worker had recorded of the painfully high-pitched noise in question.